Posted by Dave Emory ⋅ October 15, 2008Post a comment Email This Post Print This Post Tweet This! REALAUDIO NB: This RealAudio stream contains FTRs 646 and 647 in sequence. Each is a 30 minute segment. Introduction: With much of the world’s media attention focused on the Beijing Olympics, war exploded in the Caucasus, with Russian forces delivering a predictably decisive defeat to the Georgian military. Cold-War style rhetoric from the McCain campaign and the GOP eclipsed [to an extent] the fact that one of McCain’s top foreign policy advisers was a major lobbyist for the Georgian government. After examining that fascinating and [possibly] significant relationship between McCain and Randy Scheunemann, the program entertains columnist Robert Scheer’s viewpoint that the outbreak of war may have been an “October Surprise” delivered early. Scheer suspects that the professional relationship between the McCain campaign and the Georgian government may have served as a vehicle for helping to precipitate the events leading to war. It is a certainty that the Georgian conflict has been an occasion for the McCain campaign and the GOP to escalate their militarism and the venality of their attacks on Barack Obama’s national security credentials. (The term “October Surprise” derives from a gambit executed between the Reagan/Bush campaign and the Islamic fundamentalist regime in Iran, in which eventual CIA director William Casey and George H.W. Bush himself seem to have been involved. Colluding with the Iranian mullahs to withhold the U.S. hostages taken from the American Embassy until Jimmy Carter’s humiliation and consequent election defeat were assured, the Reagan/Bush campaign committed treason.) At the forefront of discussion of the Caucasus and other areas around the Caspian is the fossil fuel business. Just before the outbreak of hostilities, a key pipeline that traveled through Georgia was disabled by an explosion. Not surprisingly, the war in Georgia has served to drive up the price of oil. The broadcast concludes by examining the apparent role of speculation by sovereign wealth funds in the increase of oil prices. 1. The Georgian war of August of 2008 became a campaign issue in the U.S. presidential election. One of John McCain’s top aides was a major lobbyist for the pro-Western Georgian government. As seen below, questions have been raised about this relationship and its possible effect on U.S. policy. “John McCain’s chief foreign-policy adviser and his business partner lobbied the senator or his staff on 49 occasions in a 3 1/2-year span while being paid hundreds of thousands of dollars by the government of the former Soviet republic of Georgia. On April 17, a month and a half after Scheunemann stopped working for Georgia, his partner signed a $200,000 agreement with the Georgian government. The deal added to an arrangement that brought in more than $800,000 to the two-man firm from 2004 to mid-2007. For the duration of the campaign, Scheunemann is taking a leave of absence from the firm. “McCain Aide Lobbied for Georgia” by Pete Yost; San Francisco Chronicle; 8/14/2008; p. A4. 2. Syndicated columnist Robert Scheer has suggested that the Georgian military initiative may actually have been a gambit, conducted in conjunction with elements of the GOP and McCain’s campaign. The advent of the war enabled McCain to effect a muscular foreign and national security policy stance, contrasted by his spinmeisters with Obama’s supposedly weak national security credentials. “Is it possible that this time the October surprise was tried in August, and that the garbage issue of brave little Georgia struggling for its survival from the grasp of the Russian bear was stoked to influence the U.S. presidential election? Before you dismiss that possibility, consider the role of one Randy Scheunemann, for four years a paid lobbyist for the Georgian government, ending his official lobbying connection only in March, months after he became Republican presidential candidate Sen. John McCain’s senior foreign policy adviser. Previously, Scheunemann was best known as one of the neoconservatives who engineered the war in Iraq when he was a director of the Project for a New American Century. It was Scheunemann who, after working on the McCain 2000 presidential campaign, headed the Committee for the Liberation of Iraq, which championed the U.S. Iraq invasion. “Georgia War is a Neocon Election Ploy” by Robert Scheer; San Francisco Chronicle; 8/13/08; p. B11. 3. A pipeline running–in part–through Georgia looms large in the strategic situation surrounding the Georgian conflict. Beyond that, one should never lose sight of the paramount importance of fossil fuel production and transportation for the Caspian region. “The war in Georgia and the inadequacy of the West’s response points again to the power of the Russian energy monopoly. Europe fears protesting too much, as this might induce Russia to reduce the flow of natural gas to the continent this coming winter (Russia presently supplies 50 percent of Europe’s natural gas). Whether or not Russia marches on to Tibilisi, its assault on Georgia has further strengthened Russia’s hold on Europe: Financiers are unlikely to back new proposed pipeline systems bringing Caspian oil and gas to the United States and Europe via Georgia. “Follow the Pipeline” by Mark David Iden; San Francisco Chronicle; 8/13/08; p. B11. 4. Just before the war began, a mysterious explosion damaged the pipeline. The cause was allegedly accidental–in conjunction with the war itself and resultant heightened tension with Russia, oil prices moved sharply upward. “A fire on the Baku-Tbilisi-Ceyhan (BTC) oil pipeline in Turkey was extinguished on Monday, a senior source at BP, a major shareholder in the pipeline, told Reuters. 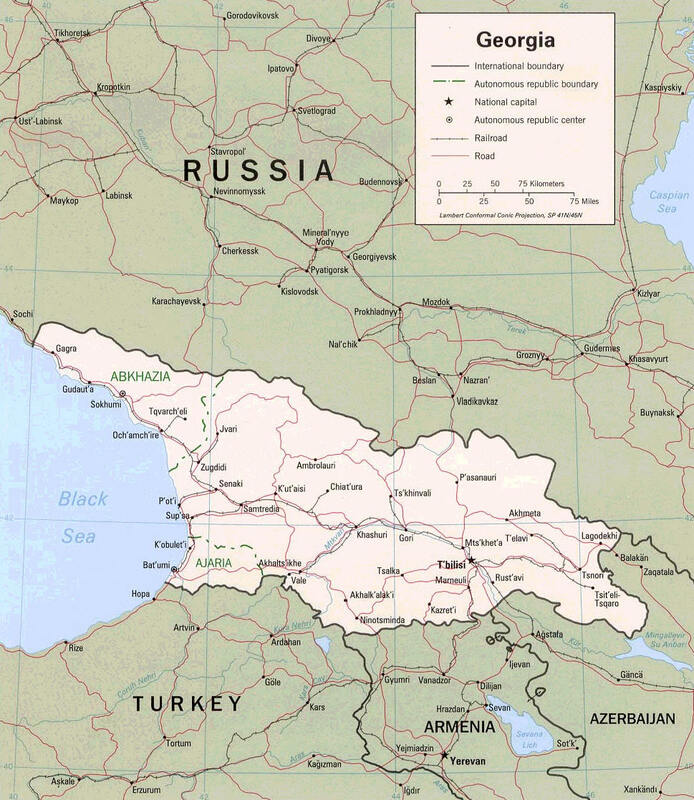 The pipeline carrying Azeri crude, which passes through Georgia, was hit by an explosion on Turkish territory two days before conflict began over the South Ossetia region. Repairs may not be finished for one to two weeks or longer, according to a source at Turkey’s state-owned pipeline company Botas. No oil is currently flowing through the pipeline. “Turkey’s BTC Pipeline Fire Extinguished, BP Reports” (Reuters); Toronto Globe and Mail; 8/12/2008. 5. As noted above, the hostilities in Georgia and deterioration in U.S./Russian relations have led to higher oil prices. “Oil prices shot up more than $5 a barrel Thursday, rising to the highest level in over two weeks as escalating tensions with Russia stoked fears of supply disruptions to the West. Crude’s rally mimicked the wild price swings seen last month and have at least temporarily halted oil’s slide back toward $100 a barrel. A weaker U.S. dollar and worries about tightening output from OPEC countries are also supporting prices. After days of brushing off geopolitical flare-ups and a tropical storm, oil spiked above $122 a barrel as traders became rattled over increasingly hostile Russian rhetoric toward a U.S.-Poland deal to install a missile defense system in Eastern Europe — a move Moscow views as a threat. “Oil Jumps $5 on US-Russia Tensions, Sliding Dollar” by Stevenson Jacobs; Associated Press; 8/21/2008. 6. Although not directly related to the subject of the Georgian war, the program concludes with examination of the possible role of sovereign wealth funds in the rise of oil prices. “Sovereign wealth funds, the massive investment pools run by foreign governments, are now among the biggest speculators in the trading of oil and other vital goods like corn and cotton in the United States, according to interviews with brokers who handle their investments at leading Wall Street banks, veteran traders and congressional investigators. Some lawmakers say the unregulated activity of sovereign wealth funds and other speculators such as hedge funds has contributed to the dramatic swing in oil prices in recent months. The agency regulating the market said it had not picked up on this activity by sovereign wealth funds. In a June letter, the Commodity Futures Trading Commission told lawmakers that its monitoring showed that these funds were not a significant factor in commodity trading. “Sovereign Funds Become Big Speculators” by David Cho; Washington Post; 8/12/2008; p. D01. In a lengthy series of tweets, President Ilham Aliyev said several Azeri lives had been lost in clashes over Nagorno-Karabakh, and pledged to restore what he said was his country’s “territorial integrity”. The US and Russia, which are co-chairs of the the Minsk Group of international mediators, expressed their concern over the flare in violence earlier this week, and called for the ceasefire to be respected.